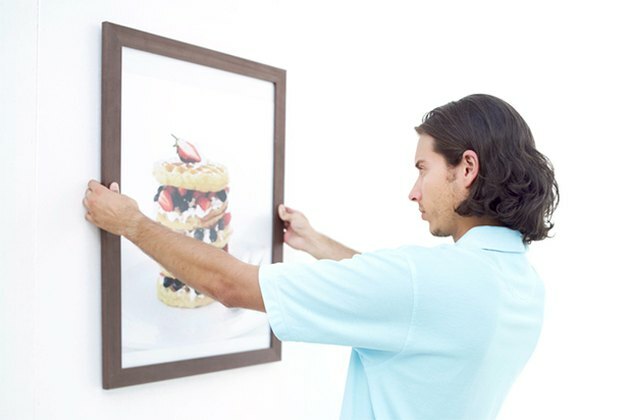 When it comes to hanging pictures, getting it right the first time is worthy of a sigh of relief – the pictures hang straight and there are no stray holes in the wall. 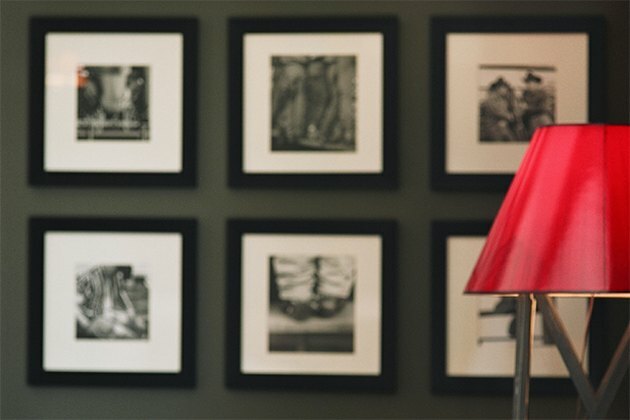 A few simple tricks and techniques ensure success in both getting the pictures neatly on the wall and in making sure they'll stay there. Arrange frame groupings to your liking before hanging them on a wall. Use this trick to guarantee your nails land in the right place. When you've found the perfect place to hang that lightweight picture and wonder how to get the nail hole in just the right spot, wonder no more. Spread a little toothpaste on the back of the picture hook, whether the hook is attached to picture wire or the frame itself. 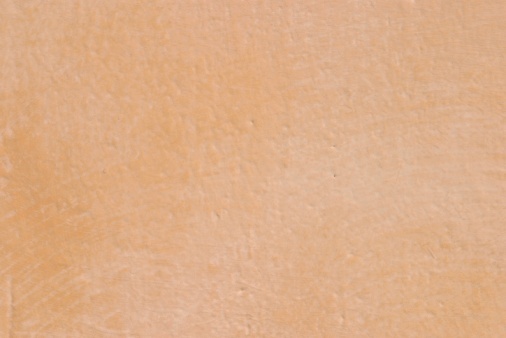 When you press the frame or hook against the wall, it leaves a dab of toothpaste behind, indicating where the nail belongs. If you'd rather not deal with toothpaste, a specialty picture-hanging tool dots the right spot for the nail while ensuring the picture hangs straight. It's helpful to have tools like a stud finder on hand. Keeping a few picture-related tools and supplies on hand means you won't have to run to the hardware store every time you have a new find to hang on the wall. A basic picture-hardware assortment kit includes wire as well as sawtooth or eyelet hangers that attach to the back of a frame that doesn't have its own hanging devices attached. 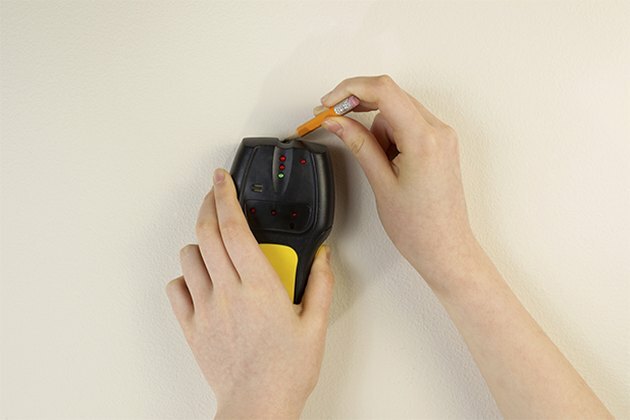 A stud finder ensures those nails have a solid means of support – the stud offers necessary strength that drywall alone does not offer. For heavy pictures hung in areas without studs, wall anchors expand behind the drywall, adding necessary support to prevent the nails and pictures from crashing down. Finishing nails 1.5 to 2 inches long do the trick for many picture-hanging purposes. For best results, insert nails at a 45-degree angle to keep the picture wire or hooks from slipping off. Arrange and rearrange your frames until you're happy with the combination. Arranging a gallery wall may seem a simple task until you hang a few frames and decide the placement is off. To avoid the hassle of hanging and rehanging picture frames, arrange the grouping first on the floor in front of the wall, rearranging the frames until happy with the look. Arrange the entire grouping on a piece of large craft paper, tracing around the frames, then tape the entire paper to the wall in a desired location. If you don't have craft paper, snap an image of the grouping, hang the dominant central photo first, then work your way outwards, picking one frame at a time from the ground and placing it in its position, relative to the other frames on the wall. Pick one frame as the focal point. Before mastering photo groupings you must figure out where to hang that first photo. If hanging only one frame, the center of the picture should be at about eye level. The same applies to groupings – the focal point of the grouping belongs at eye level on the wall. Take nearby furniture and room accessories into consideration when choosing pictures for each wall, working with similar themes and color schemes that complement the space as a whole.